One winner will kick off the new year with one touchdown of a prize! 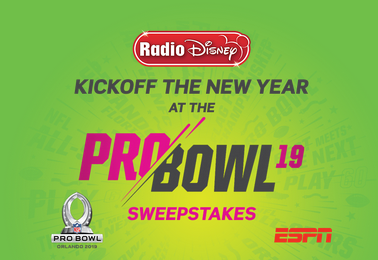 You could be headed to Walt Disney World Resort in Florida & the NFL Pro Bowl where you can get up close and personal with NFL stars. You’ll watch them practice at the ESPN Wide World of Sports Complex, visit all 4 Disney Theme Parks, including Disney’s Hollywood Studios where you can experience fun-filled adventures at the all-new Toy Story Land! Open to US residents ages 7+. Contest end January 10, 2019. There is one entry per person per day.